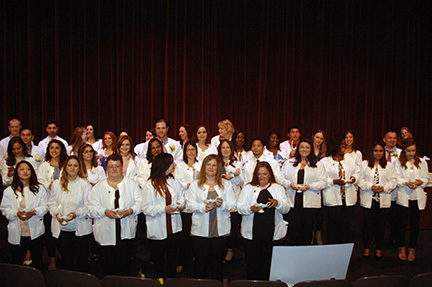 The Nursing Pinning Ceremony concluded with 36 MCCC Nursing Program graduates reciting the Nightingale Pledge. Five students earned special awards. From left are award winners Adria Trapani-Barnacz, Katelyn McCarthy, James Buonanno, Jennifer Whitman, and Rebecca Hanaway. Rebecca Hanaway, valedictorian for the MCCC Nursing Program Class of May 2017, addresses her fellow graduates. 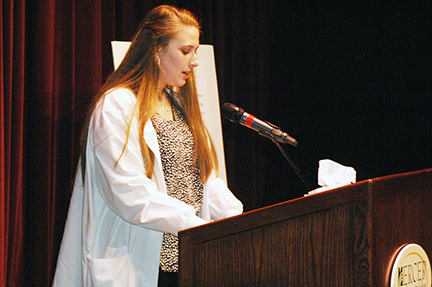 WEST WINDSOR – With an Associate Degree and numerous opportunities before them, graduates of the Mercer County Community College (MCCC) Nursing program were urged to "keep going" at the Nursing Pinning Ceremony May 16 in Kelsey Theatre. Director of Nursing Education Elizabeth Mizerek presided over the ceremony where 36 MCCC Nursing program graduates received their pins, a rite of passage for nurses that dates back to the Crusades of the 12th century to recognize the hard work required to treat the injured and the sick – the same hard work required today to obtain a Nursing degree. In her address to graduates, MCCC President Dr. Jianping Wang praised the students for their commitment to their studies and their commitment to their chosen profession. In addition to the pinning ceremony, five special awards were given in recognition of outstanding performance. 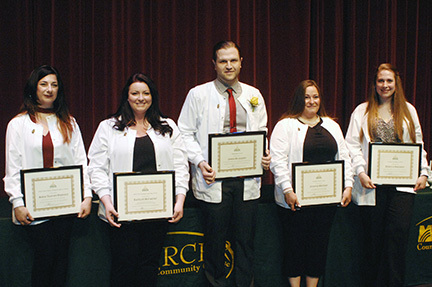 Adria Trapani-Barnacz received the HelenMarie Dolton Clinical Excellence Award; Katelyn McCarthy was the recipient of the Clara Lidz Nursing Leadership Award; the Nightingale Award went to James Buonanno; Jennifer Whitman received the MCCC Nursing Faculty Award; and valedictorian Rebecca Hanaway received the Academic Excellence Award.